After 2 horror picks for Vic’s Movie Den to kick things off, I would like to introduce you to a movie which has been low on the radar. As we all know, Jean Dujardin has won the oscar for his role in ‘The Artist’. What some of you may or may not know is that in France (where Mr. Dujardin) was born, they have a French equivalent of the Oscars called: The Cesar. Mr. Dujardin was of course nominated for his turn as George Valentin but he didn’t win the Cesar. 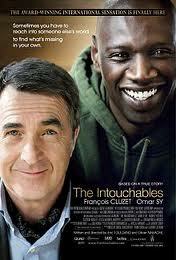 He lost it to a guy called Omar Sy, the first black actor to win the prestigious award. His turn as Driss, the petty criminal from the outskirts of Paris who gets a job as caretaker for a wealthy quadriplegic, is brilliant. The movie is based on the true story of Philippe Pozzo Di Borgo, as mentioned, a wealthy aristocrat, who needs a new assistant. Having been a quadriplegic for a lot of years since his paragliding accident, Philippe (played by an equally brilliant Francois Cluzet) has grown accustomed to having a new assistant every so often but when Driss walks in, a poor guy who is looking for a signature so he can get his welfare check, Philippe sees the right man for the job. From the first minutes onwards, we know we are in for a quality time. The Earth, Wind and Fire song ‘September’ sets the tone for an extraordinary movie about friendship, real friendship, and the obstacles you have to overcome, mainly in judgement, about one another. In essence, this would qualify as a ‘buddy movie’ which would be heavily underselling it. On top of that, yes, they speak French in it, so a lot of people will be turned off by it before even giving it a shot. By all means this is probably the best movie to come out of France until the present day, and it’s not only a powerful story with strong performances.It’s shot expertly by the directors duo of Olivier Nakache and Eric Toledano who have done a handful of French films up until now. With intricate shots and a playful way of taking us along, they manage to keep the story not only touching but exciting as well. It’s not a love letter to Paris, nor is it a glorified character-piece. This is a story that has happened in real life, with real people, with only a handful of adjustments to suit the laws of movie-making. It’s raw emotional beauty captured on celluloid, and its well worth your time.